Before residential lots can be created, an applicant must first obtain a development permit approval for reconfiguring a lot (RaL) from the local government authority. In the year to March quarter 2014, council approved the development of 6,069 residential lots. This was an increase of 149 per cent compared with the same period last year when 2,434 lots were approved. 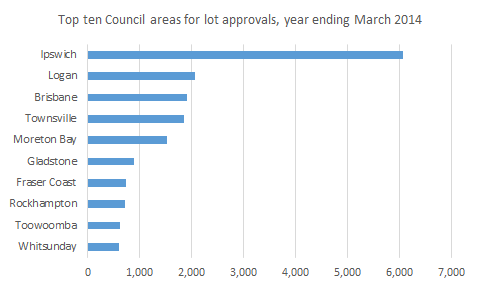 As a result, residential lot approvals in Ipswich now far exceed those in other local government areas (see chart below). Many of the lots approved in Ipswich are obviously in housing estates in the early stages of development at Springfield and Ripley Valley. While Ipswich is far ahead of other Councils on lot approvals, it remains behind Moreton Bay, Brisbane and Gold Coast in terms of new lot sales. But, with recent lot approval numbers, Ipswich must be well placed to leap ahead of other local government areas in new lot sales. I expect builders will do very well out of growth in Ipswich in coming years. Briefs on residential land development in a number of local government areas are available at the Government Statistician’s website. This entry was posted in Housing, Ipswich and tagged buildingindustry, housing, ipswich, lotapprovals, qld, queensland, residentialland. Bookmark the permalink.